LOCATION.--Lat 4l`59'48", long 77`08'25", Tioga County, Hydrologic Unit 02050104, on left bank on SR 4022, 0.5 mi downstream from Cowanesque Dam, 0.8 mi upstream from highway bridge on U.S. Route 15 in Lawrenceville, and 1.4 mi upstream from mouth. PERIOD OF RECORD.--June 1951 to current year. Prior to October 1951 monthly discharge only, published in WSP 1722. GAGE.--Water-stage recorder and water-quality monitor. 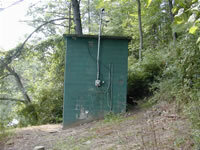 Datum of gage is 983.96 ft above National Geodetic Vertical Datum of 1929. Prior to July 1976 at site 1.1 mi upstream at datum 14.07 ft higher. Satellite and landline telemetry at station. REMARKS.--Flow regulated since December 1979 by Cowanesque Dam (station 01519995). Supplied by NWS: Action stage-11 ft; Flood stage-13 ft, the right or south bank overflows near town affecting homes in low lying areas; Moderate flood stage-14 ft, several homes flooded on the right or south bank; Major flood stage-17 ft, Widespread flooding on right or south bank. Most of Lawrenceville will be evacuated.